A sliding window consists or one or two sashes that overlap and seal together. One or both of the sashes slide horizontally to allow for ventilation. 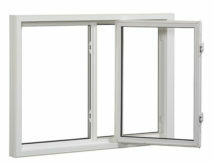 These windows are commonly used in bedrooms, kitchens, bathrooms, and basements. Sashes tilt in for ease of cleaning.